Shopping for bread has changed over the last decades, a development I personally regret. Large bakery chains have entered somewhere back in the nineties and many small family-run bakeries have vanished over the years. Buying from a chain bakery or even discount bakery doesn’t automatically imply inferior products, but I always prefer the small and independent or even family-run originals around the corner. No two bread rolls look the same and on Saturdays a line usually starts forming outside the bakery. When I have to leave the house in the wee hours of the morning, the air is already permeated with a heavenly smell from the bake-house in our backyard. They offer what I would – without a hint of hesitation – call the best sourdough bread (Bauernkruste) I have found in Munich so far, great rolls and baguette-like variations. And yet, one important piece is missing, one I rather not speak about: their croissants. The pretzel croissants they make are actually quite ok, but the regular ones are far from what I expect from my croissant. Opposed to what many believe, croissants are NOT of French origin and despite the plethora of legends and myths that are and have been circulating, the croissant is Viennese. Backed up by the fact – so Alan Davidson, editor of the Oxford Companion to Food– that no printed recipe for the croissant (as we know it today) appears in any French recipe book before the early 20th century (the earliest French reference he found in Payen’s Des substances alimentaires from 1853). Where was I? Yes, my croissant. ONE, it’s got to be a perfect mix of chewy and fluffy, which makes it easier to “unwrap” (my favorite way of eating a croissant). TWO, light-golden-brown in color. THREE, not too flaky, which makes it an excellent don’t-need-a-plate snack. FOUR, baked with plenty of butter, getting your fingers all greasy is a good sign and unavoidable and FIVE, a melt-in-your-mouth taste. Hm, I wonder, am I asking too much? The butter block: Knead the butter shortly to be able to form a butter block which is square (about 22x16cm/8.5×6.3 inch) and about 1cm (0.4 inch) thick. Books usually give instructions about the exact size of the block, but I found it to be less important, as long as you adapt the size of the dough (see below). 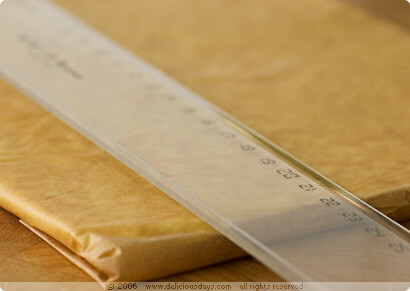 I had my working space covered with a sheet of parchment paper, in which I wrapped the prepared block. Place in the fridge and chill it; it should not become rock hard though! Preparing the pre-dough: Dissolve the yeast in milk and combine with sugar, eggs, oil, flour and salt. Knead only very lightly. If too soft, add a bit more flour. Form a rectangle, double in size of the butter block. Place the chilled butter in the center and fold the flaps over the butter without stretching them too much (lock-in). Carefully press together the edges to seal in the butter. 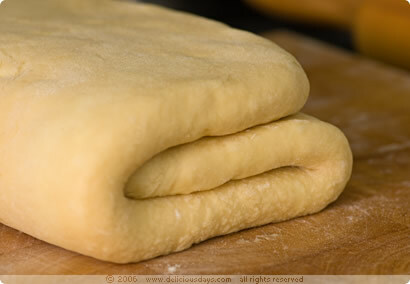 The dough package should be folded uniformly to form a nice square. The first three-fold: Roll out with a rolling pin, turn the dough over occasionally to keep the edges even. Don’t forget to dust the dough with flour to prevent it from sticking. Continue until the dough is about 1cm (0.4 inch) thick again. Then fold the dough like a business letter into 3rds. Do another three-fold. Cover with foil and chill for about 30 minutes. Do two or three more three-folds, cover and chill for a few hours (or over night) before proceeding and forming the croissants. Cut the dough in half to make handling easier and roll it out until about 3mm (0.1 inch) thick. Cut in pointed triangles, fill with a piece of chocolate or a small teaspoon of Nutella (if desired) and form little crescents by rolling the shortest side tautly up to the tip of the triangle. Place all on a parchment covered tray, paint thinly with egg yolk (more for looks) and let rise for an additional 15 minutes. Bake in a preheated oven at 180°C (355°F) for 15 to 25 minutes, depending on size, until they are golden brown. Resume: Considering the fact that this was a first for me, both making the puff paste AND the croissants, I felt like the queen of baking. Seriously, I wasn’t quite sure if I could pull it off, preparing something as advanced as puff paste. It was a huge relief to see the croissants turn out not only pretty looking, but also deliciously tasting. I’ve experimented quite a bit with sizes and fillings, but I’m sure there are plenty of tricks I haven’t considered, yet I’m very happy with the results. What’s the catch? The time factor – it does take quite a bit of time, is it worth it: you bet! Too bad our freezer isn’t large enough, otherwise I would have loved to try freezing them – unbaked – for next Sundays. Kudos to making ur own puff pastry dough! Lazy me is still relying on the pre-pack ones... 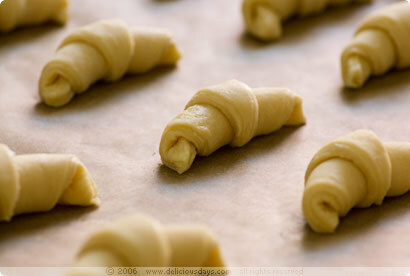 :P..I will definitely try making my own croissants one of my sunday cookouts. Wow this is very difficult to bake. I can see the nice layering of the croissant, you must had spend long time doing it!. Making your own croissants, wow, I'd never dare to! But you are right on the quality of baked goods, just because a bakery sells fantastic bread doesn't mean, that everything else is equally outstanding. My favorite bakery sells the best pretzels, but I wouldn't recommend their bread rolls. These croissants look delectable. Thank you for using gram weights in your recipe. Chapeau! Niki, Du bist die Königin der Backstube. Das war wirklich eine aufwendige Angelegenheit. Aber was für ein Resultat. Wunderbar!! Es ist in der Tat so gut wie unmöglich hier solche Croissants zu bekommen. Zu weich, zu trocken (Milchbrötchenteig), zu splittrig (wie Schweineohren), nach Vanillin riechend, mit fiesen Fetten gebacken. Ein Trauerspiel. Danke für die schöne Anregung. You never cease to amaze. Beautiful!!! danke fuer die super anleitung! Your croissants look delicious - beautiful photos! Did they live up to all five of your expectations? I'm looking forward to trying to make my own croissants shortly - so thanks for inspiring me to make them sooner than later! I just love them, but the thought of making them on my own is terrifying. the homemade croissanta look yummylicious. I recently had some good croissants in Montreal, but nothing beats homemade goodies. Thanks for sharing. One day, one day, I will attempt my own puff pastry. 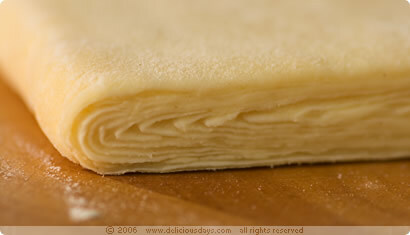 Until that day, I will stare at your close-ups of that fantastically layered dough... gorgeous photos. I especially love that burnished brown top on the final croissant, courtesy of the egg wash. Yum. Quoting from wikipedia: One legend is that the croissant was invented in Vienna, either in 1683 or in an earlier siege in 1529, to celebrate the defeat of the Turkish siege of the city, as a reference to the crescents on the Turkish flags. Although this version is supported by the fact that croissants in French Language are referred to as Viennoiserie and the French popular belief that Vienna born Marie Antoinette introduced the pastry to France in 1770, there is no evidence that croissants existed before the 19th century. Adding to it, supposedly bakers who woke up early to make the bread heard the Ottoman army approaching, woke up the soldiers and the siege was not succesful. The bakers were given the honor to create an item to commemorate the day. Hence the Turkish flag looking crescent rolls. Most impressive! I make lots of bread but I've never had the nerve to try making croissants - I'm bookmarking your post for when I get up the courage. Because your croissant definition is exactly like my croissant definition. Thanks for posting! Your homemade croissants the look perfect! I'd never have the patience for something so time-consuming, but I'd love to be test eater, too! And not only your croissants! Wow, such talent you have! Those look extremely difficult to make. I dream of having the skill needed to make something as great looking at that someday. And that 3rd picture, I want to lay my head on it! If they taste as good as they look... I'm tempted to bite into my screen. The ones on the picture with the baking tray look like tiny baby croissants, sweet! No! There is no a better way than this! wow i can't believe you made your own croissant! i'm getting stressed just thinking about it. although your pictures are making me salivate. This is another one I have never tried - croissants. I'm just starting to get my head around bread making (and may soon venture into a sourdough web experiment), so might eventually get around to these. and I love kneading dough, maybe a bit work but I think it's worth it - will definitely try them sometimes! Thank you for all the steps and pictures! Wow, die sind wunderschön! Ich habe auch schon welche gebacken, nur sind sie nicht so schön geworden. Ich schiebe die Schuld jedoch auf den heissen andalusischen Tag. ;-) Ich hatte nämlich ziemlich mit dem Teig zu kämpfen. this is one of the most beautiful blogs I have seen. Die Croissants sehen ausgezeichnet aus, wenn die so schmecken wie sie schön sind, dann aber hallo...you guys are great. thanks. "Hum ils ont l'air trop appétissants" _ Too much yammi !!! A French girl who never cooked croissants, even a Sunday morning ! 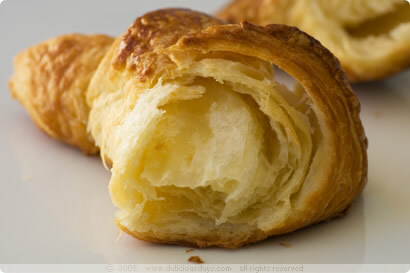 Wonderful flaky layers of croissants! I can't believe you're making it for the first time. Your croissants look gorgeous! I'd love to start my day with one of those. And your list of requirements, is right on. That is what makes a croissant a croissant. Croissant perfection! You did a great job! I bookmarked the recipe for an upcoming Sunday. So impressive! These look lovely. yay! long live vienna and its mehlspeisen! but however nice the story may be and however proud it makes me feel, I very much doubt that the croissant was invented in Vienna - if it was, surely our croissants would taste much better? but it is equally difficult to find the proper thing there! 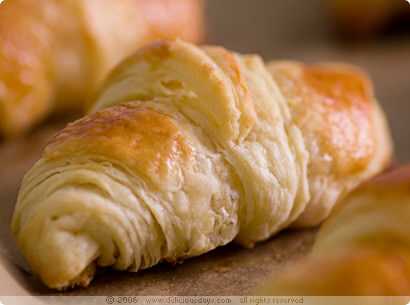 "Croissant...This delicious pastry originated in Budapest in 1686, when the Turks were besieging the city. To reach the centre of the town, they dug underground passages. Bakers, working during the night, heard the noise made by the Turks and gave the alarm. The assailants were repulsed and the bakers who had saved the city were granted the privilege of making a special pastry which had to take the form of a crescent in memory of the emblem on the Ottoman flag." It became a sensation in Budapest and Vienna and it was Marie Antoinette who brought it to Paris. I have to add that it's quite impossible to get a good croissant in Budapest, so I will have to try your recipe. I haven't worked up the courage yet to make croissants but everytime I see someone else do it, I come a little bit closer, thanks for the push. Gute Croissants sind schwer zu finden, oh ja, wie recht Du hast! Deine Essential-Liste trifft es auf den Punkt, allerdings muss ich erstmal mit einem normalen Kuchenrezept klarkommen, bevor ich mich an selbstgebackene Croissants rantraue. yeah I'm getting a good idea for the kochtopf food event 17.
a timbal of leberkase with layers of brezen and mustard mouse. with a radish garnish. Hi Pille, Please prove him wrong, and let me know if you suceeded! Scott, A sourdough web experiment, I'm all intrigued now! It's like a virus, once you start making your own bread, you can't stop experimenting. Let me know, once you laid your hands on croissants! Oh and those are great pictures from your farmers market! Sue, And you're right, those were baby croissants, I experimented quite a bit with various sizes. The small ones however tend to get a little dry, well, if left too long in the oven. Hi Gilly, I knew someone would ask ;) Yes, they did - but then, am I really unbiased about my own work? I gave some to my neighbours and they loved them. I'd say still room for improvement, but a definite keeper. Croissants are my weakness! Especially chocolate-almond ones. My mouth is watering. I know I'm totally incapable of making them but I can't resist to urge to try. Btw, I made your grandma's jelly roll last week and it was delish! Thanks. Sehr schön sehen sie aus, deine Croissants! Ich habe mich ja auch schon drangewagt, zu sehen in meinem Brotkasten. Ich ziehe die Teigdreiecke vor dem Einrollen immer etwas in die Länge, damit man mehr Windungen bekommt. Auf die untere Kante setze ich dann einen kleinen Teigrest, so bekommen die Croissants einen schönen Bauch. I make croissants at work but not at home...what an accomplishment! They look perfect! Je t'invite à venir voir mes croissantsréaliser il y a peu. Beaucoup de tes recettes m'interessent, je vais essayer de traduire sans me tromper. wow! your pate feuillete is beautiful! bravo! Hi Petra, Hab mir nochmal alle Deine Tricks und Tipps einverleibt, man lernt ja nie aus. Das mit dem Teigrest für den schönen Bauch werde ich auf jede Fall ausprobieren. Thanks a lot for sharing the recipe! Hi Zacky, I think yours turned out beautifully, you are a talented croissant baker! Thanks for sending the link and feedback. i've never been to this site before, and am having a difficult time finding and navigating. my children love croissants, and i'm dying to give it a try. would greatly appreciate your help. thank you kindly. Amazing recipe! Tastes so rich and scrummy with the egg yolk...I've also tried a different croissant recipe (from the book "advanced bread and pastry) that has a polish (starter), and without egg and less butter, and it gives quite a different taste and crumb! Will post it here. I'm afraid all of the rolling will make them tough?? Or am I over-mixing the dough in the initial stages? Any advice you can give me would be wonderful.... I can't wait to try yours!! I'm so impressed. Your croissants turned out to be so beautiful! I noticed before that someone requested if your recipe could be converted to cups, tbs, tsp. I am have done the conversion but with baking am afraid that not having perfect measurements it will not yield good results. Can you please tell me if I can find this same recipe converted to the above mesurements. I live in the US and am having difficulty as the conversion from g to cups, tsp, tsb does not yield good results. Can you tell me if I can find same recipe converted. Existiert die Fritz Muehlenbaeckerei noch? War immer meine Lieblingsbaeckerei als ich noch in Muenchen war - ist allerdings 10 Jahre her. Your images look grand but I found this to be a terrible recipe. Considering the complexity of croissants, the instructions you give are horribly vague. Hi I am making this recipe RIGHT NOW! Can you tell me if the "butter" you call for is SALTED or UNSALTED? Thank you! Nicky: Unsalted. I always use unsalted butter, otherwise I would clarify it in the ingredients list. according to the instructions, this means that the dough has to be folded into thirds, then folded again and again. the refolding makes it so small that the last part is too difficult to fold. i saw a recipe online where someone had folded it, turned, rolled it out again and then folded it, rolled it out again, about 6 times. is THAT what is supposed 2 be done or just folding 4-5 times? if you see the picture of your first fold, then according to instructions it can only be folded twice or 3 times max. no more. can you elaborate? im trying this nonetheless! This may be a bit late seeing as the last post was over a year ago, but the Münchner Boulangerie in Schwabing (Bauerstrasse) has amazing croissants that will make you weep with pleasure - just for those days when making your own would interfere with baking four three-tiered cakes like you promised your best friend for her birthday. Sigh.